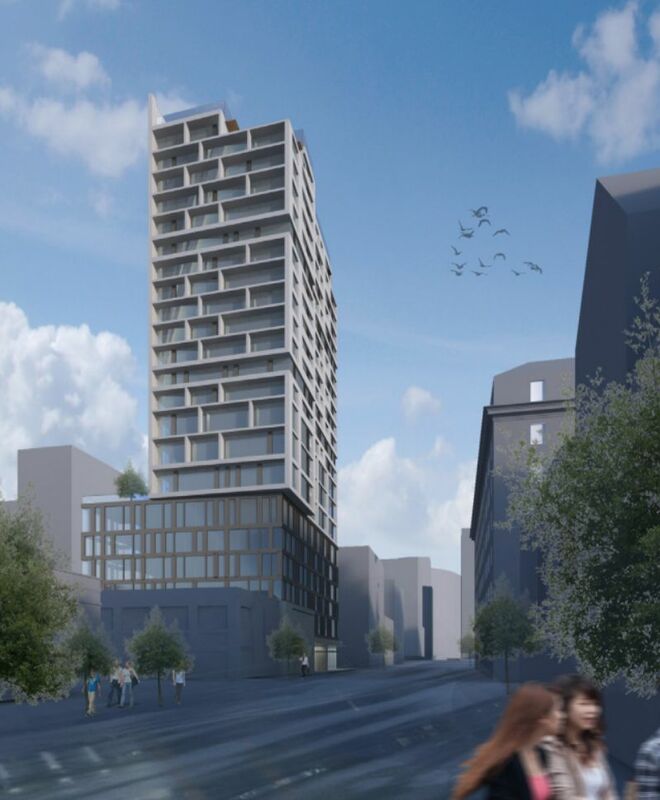 An Oakland developer has just submitted plans for a new 22-story highrise at Harrison and 14th Street that would combine 127 residential units and office space on the lower floors. The tower at 1331 Harrison Street would replace a surface parking lot pictured below, and it's being proposed by local developer Irene Lo with development consultant Ronnie Turner, as the SF Business Times reports. In addition to the housing units on the upper stories, the 240-foot-tall building would contain 63,000 square feet of office space as well as ground-floor retail. Turner tells the Business Times, "It adds to the spectrum of development going on around it, and I think it’s a good blend," adding, "We're fitting the bill for two needs in the neighborhood, office being the driving force." The building would add hundreds of new residents to the downtown area, and it would sit just a few blocks away from the 12th Street BART station. The tower would join several other significant developments that are rapidly changing the skyline of Oakland, just as SF's own skyline has been being transformed. Developer Lennar Multifamily Communities is well underway on the construction of a 34-story residential tower near the 19th Street BART station at 1640 Broadway, having had a "topping off" ceremony back in November. And the tallest residential building in the city, the 40-story Atlas at 1314 Franklin Street, is also nearing completion, as is Gerding Edlen's 23-story tower at 1700 Webster Street. Meanwhile, a few blocks away on West Grand Avenue, at 2201 Valley Street, TMG Partners just won approval for a 420-foot-high office tower with 23 floors and 760,000 square feet of new office space. In other words, if you haven't seen downtown Oakland in a while, you may barely recognize it in a matter of months or years. The Chase Center has just announced that The Black Keys will be performing in SF on November 20, joining the slowly trickling-out lineup at the new Warriors arena. Republican congressman and devoted Trump defender Rep. Devin Nunes of California has filed a defamation lawsuit against Twitter and a couple of parody accounts that enjoy making fun of him, and SNL couldn't have written a funnier script than this lawsuit and the ensuing Twitter pile-on.